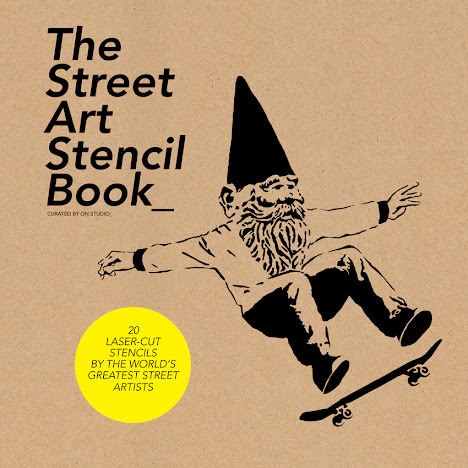 The Street Art Stencil Book , by On.Studio and published by Laurence King recently is a pure celebration of the art of the stencil. It features 20 laser-cut stencils by street artists. The 20 stencils are on perforated card so they can be easily removed and used. As well as a profile of each artist and an in-situ photograph to accompany their stencil, there is also an interview with Blek Le Rat. Tagged by many as the father of street stencil art (despite his own citing of John Fekner as its originator) Blek Le Rat has been the movement’s driving force for nearly thirty years. As well as giving an interview in which he discusses his work and what he thinks about street art today, he has created a stencil for the book. Stencils included have been created by: AIKO, Alexandre Orion, Btoy, Bandit, Ben Frost, Blek Le Rat, Bork, C215, D*Face, EElus, Eine, Hush, Jef Aérosol, Logan Hicks, M-City, Mantis, Nick Walker, Paul Insect, Pure Evil and X0000X. The book is available from Amazon and other good bookshops.